This nice area plenty of parks, coffees and chic shops, is one of the most beauty neighbourhoods in Buenos Aires, don't miss to walk across Quintana or Alvear av, enjoy the pure style of the Iglesia del Pilar (Pilar Church), use your saturday evening in Buenos Aires to see the Artisan Market at Plaza Francia (Francia Square), and also rooms one of the most interesting places in town, the Recoleta Cemetery. The Recoleta area is one of the places that justifies the nickname of Buenos Aires as the “Paris of South America”, not only because of the amazing French architecture around but also by its chic flavor. Recoleta is full of Cafes and restaurants, and it its vast parks you will also see fancy pets walked by dog walkers. The street lamps, the clothing of the neighbors, everything delivers to an ideal image of Paris. 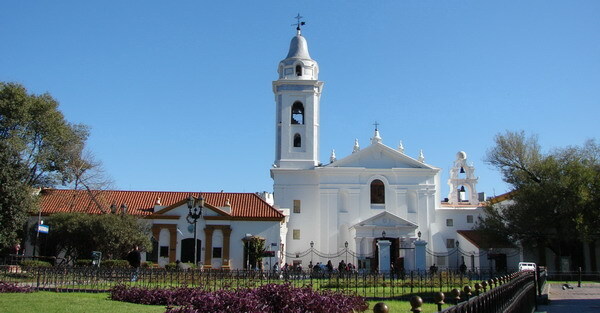 Recoleta is the area of the old money people with international brand stores and huge palaces. The Recoleta people call themselves “people like me”. By sarcarsm of life, the heart of Recoleta have no beat, it’s a Cemetery and you cannot miss in your holidays in Buenos Aires! I bring Recoleta private tours which also includes a visit to this amazing place. There are two iconic avenues in Recoleta, Quintana Av, the place of the fancy stores, and Alvear Av the one of the palaces and mansions. 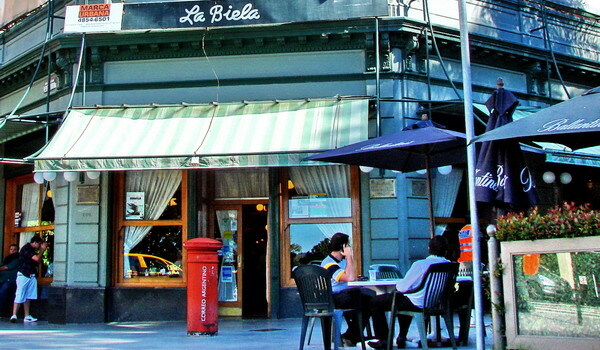 La Biela is one of the most traditional Cafes in town, and is located at the main corner of Recoleta. The top people used to stay there, young wealthy kids who later on become Formula 1 racers, artists, and world class writers like Jorge Luis Borges. 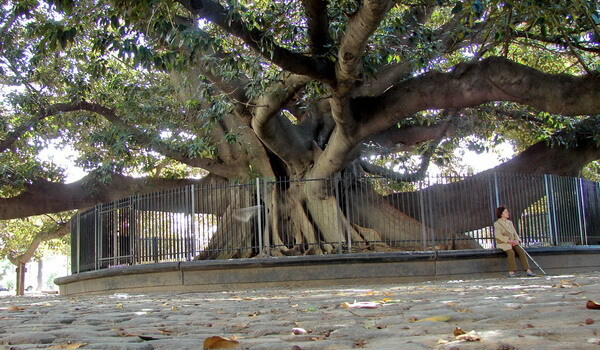 La Biela Café is a place to seat to watch and being watched under the shade of the giant gum tree, another character of this neighborhood, planted in 1800 by the Recoletos monks (You can easy associate this Monks with the name of the area). 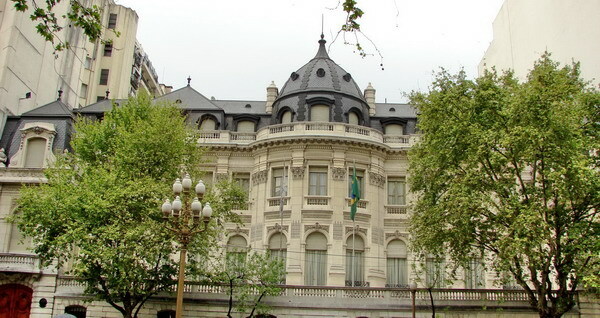 Recoleta also rooms important Museums like the Fine Arts Museum of Buenos Aires (Bellas Artes) or the Museum of Decorative Art (Palacio Errazuriz). In my Recoleta private tours we usually visit a couple of rooms of the Fine Arts Museum to feel in a couple of paints part of roots of Argentina. Art is around in Recoleta, modern sculptures and monuments like the Floralis Generica or the Monument to Evita are beside traditional World masterpieces like the Bourdelle’s Heracles Archer. During the weekend there is one of the many hand-craft markets of Buenos Aires with incredible souvenirs and clothings. 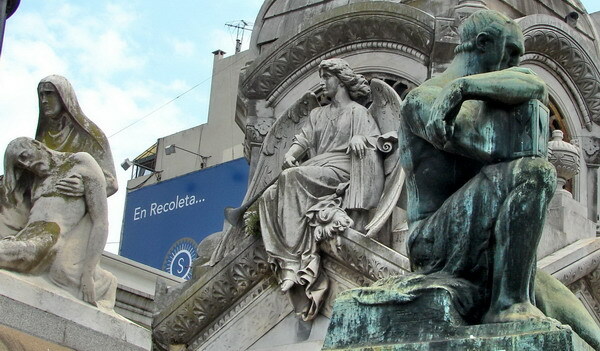 Recoleta is one the places you shouldn’t miss when you visit Buenos Aires, Let’s visit it together! Recoleta Cemetery is a unique art and architecture masterpiece in the world, a huge colection of architectural jewels and nice tales, like the Rufina Cambaceres's story, or Evita's Grave, where you can know about the story of her Pillgrim Corpse, source of many questions, tears and novels. 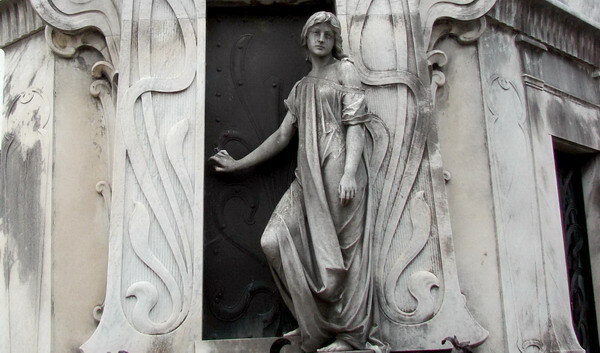 You shouldn't leave Buenos Aires without dedicate a private Recoleta Cemetery tour to this place! Part of a silent debate between the Independent new Government (with masonic bases) and the Catholic Church, the Recoleta Cemetery born as part of a fight for controlling the power of a conspiratorial church. The Recoletos monks and the other religious orders where managing the burials, but the Government forbidden to bury people inside of the churches due to hygienical reasons. The Recoletos monks lost the right to still burying the wealthiest people in town and her huge farm was expropiated in order to develop the new cemetery. It was 1822 and the graves of that period where modest not only because of lack budget but also because a conception about greco-roman simplicity. Redesigned in 1881 by the same aristocracy that built enormous Palaces to live, Recoleta cemetery become an architectonic jewel plenty of little mansions, mini gothic cathedral and masonic piramids, though for the eternal rest, decorated with more than 5000 World Class sculptures made in France and Italy. 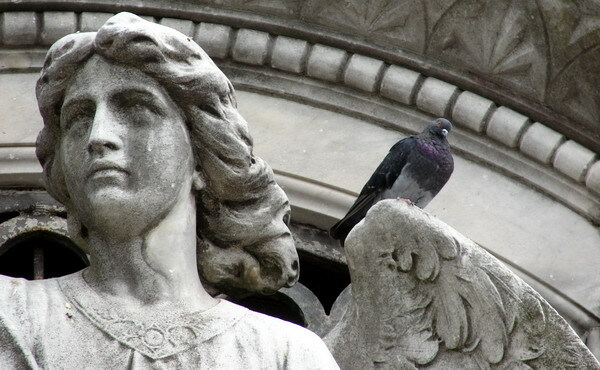 We can stroll the place and the aristocratic surroundings in my private Recoleta Cemetery tour. Artisans, sculptors, builders and materials from Italy and other countries of Europe, made the long journey to the future dead people dwelling and created this Necropolis (literally City of Dead People) very similar to the Monumental Cemetery of Milano, but with unique features in the World. The tension between the Laic-republican ideology and the Catholic vision, not only could be seen in different cripts but in the origin of the lot, it implied not also the expropiation, but the definitive lose of the right of the Church to ask for a rent for burying devote people in the Temple. The new Cemetery would soon room the most important characters of the Argentinean life, as politicians, military, artists and writers. The bowels of the cemetery rooms 19 presidents of Argentina, by example.